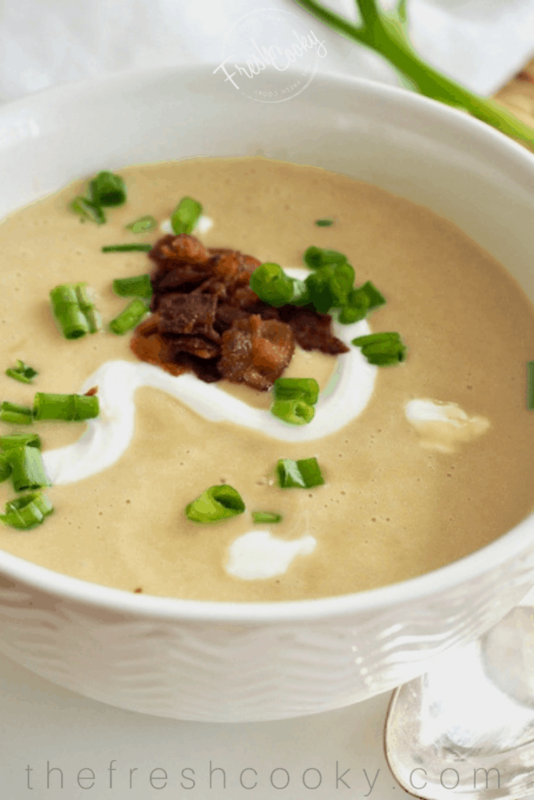 Potato Leek soup is a silky, elegant and classic soup. This simple soup recipe is gently flavored with leeks and creamy potatoes, rich broth and delicate spices. 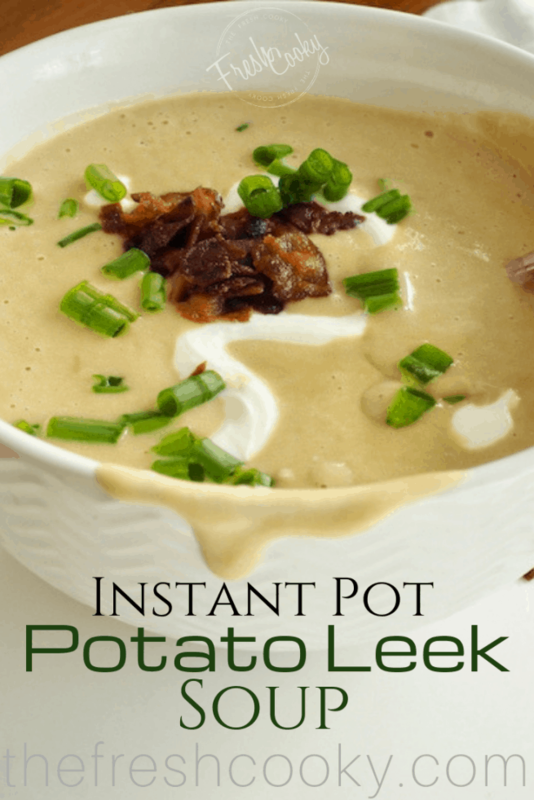 Easy to make in your Instant Pot® (electric pressure cooker) or stove top. I think leeks get a bad rap, they look like overgrown green onions and while they look ostentatious, intimidating and maybe even unsavory, if you haven’t cooked with leeks, YOU are missing out. Big, robust, and a little rustic; these awkward looking giants of the onion family impart a sweet, delicate flavor to soups, stews, egg dishes and more. I use them often in dishes like my Prosciutto & Gruyere Hashbrown Quiche and Beef Bone Broth. Please give them a try! Pair those leeks with vitamin C rich, creamy potatoes and a few other simple ingredients; in no time you will be enjoying a decadent, mouth-watering, healthy and silky soup; great as a starter or serve a big bowl as a main dish. Comfort food! 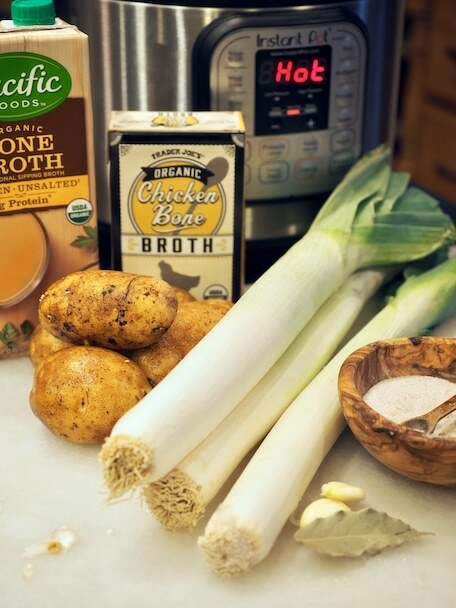 Typically I make this soup on the stove top (instructions in recipe), but more recently I’ve adapted it to my new Instant Pot®. 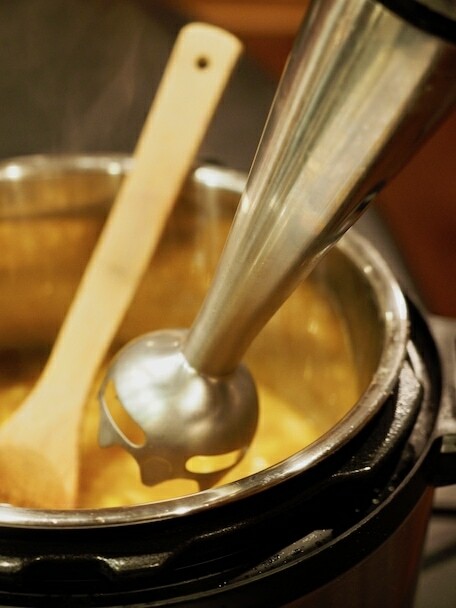 If you don’t have one, don’t worry, you can achieve the same results with a good sturdy soup pot. So the pictures will show the Instant Pot®, but the recipe will include instructions for both stove top and pressure cooker. READY? Gather your ingredients and prep (wash, peel, slice, dice, mince, measure) for quick and easy soup assembly. Cut the dark green part off, trim the rooted end off keeping the light green to the white part, discard the cut off portions. Slice in half lengthwise, run under cold water removing any sandy dirt (be sure to wash them well) and then slice into 1/4 inch slices. Press the Sauté button on the Instant Pot®, when it reads “HOT” add oil and butter. Add the leeks and sauté, stirring occasionally, until soft and lightly browned. Add the garlic and stir until fragrant, about 30-60 seconds. Pour in broth, stirring well and scraping bottom incorporating all of the flour. Add cubed potatoes, bay leaf, sea salt, pepper and nutmeg (trust me on this one). Stir well. 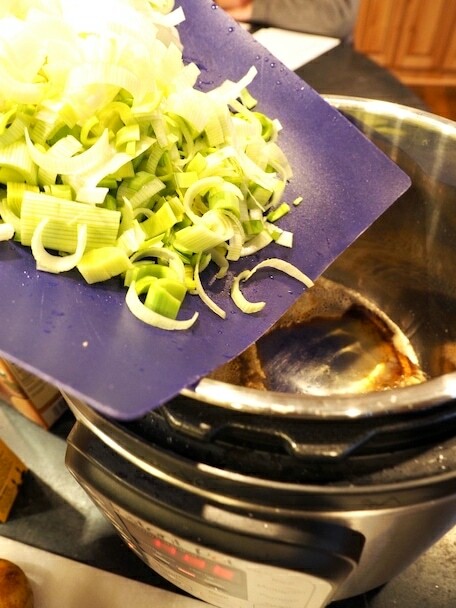 Place lid on the Instant Pot® and set the steam release valve to sealing position. Adjust time + or – to 7 minutes in Manual or Pressure Cook mode on Instant Pot. When cooking cycle ends, allow the pot to release pressure naturally for 15 minutes, then release balance of steam (careful)! 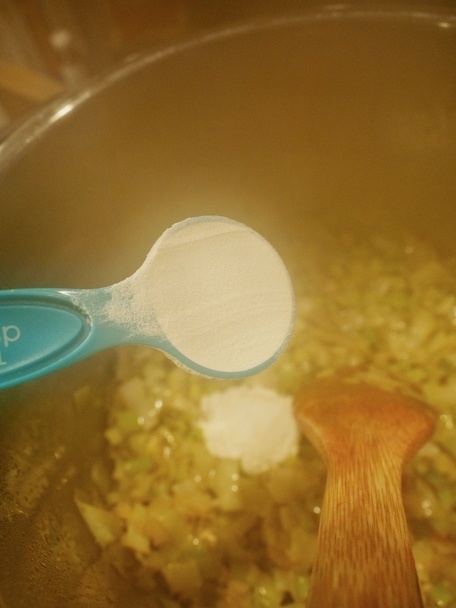 Once the pin drops on the steam release, open the top and stir the soup. Be sure to remove your bay leaf. 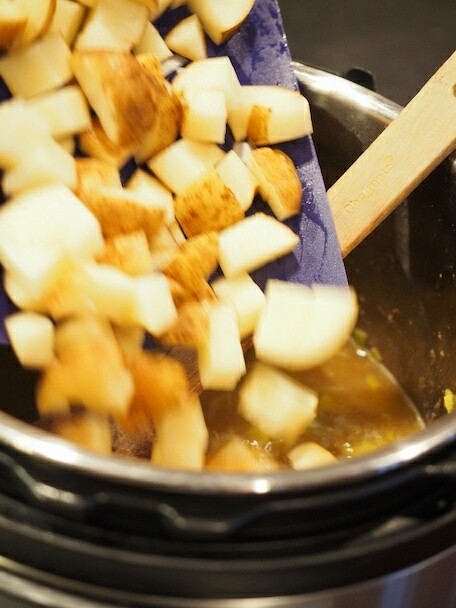 Option 1 | Using an immersion blender, blend right in the pot until smooth and silky. Option 2 | Puree in a blender in small batches. 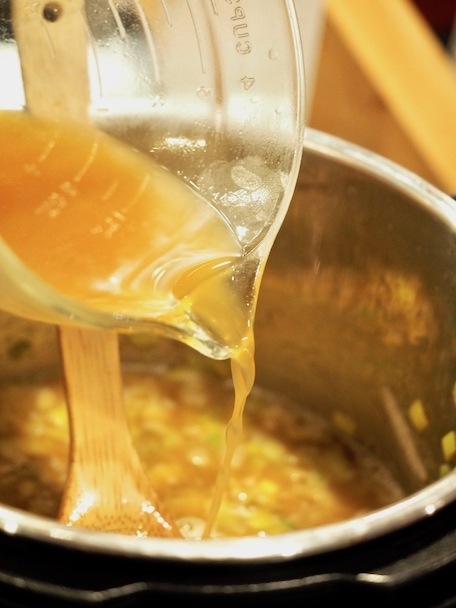 Pour a couple ladles of soup into blender and purée, pour puréed soup into another pot or large bowl until all soup is blended, return pureed soup to pressure cooker pot. Option 3 | Have a Vitamix? 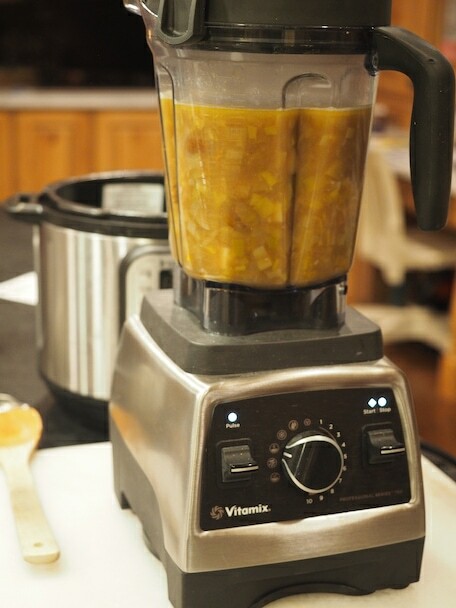 Pour the soup into blender (if the container is large enough, if not, do in batches), turn Vitamix to low speed, then slowly increase the speed until smooth and steamy. After soup is puréed, pour in your half and half (coconut milk, heavy cream or whole milk may be substituted), stir until combined. Taste and adjust seasonings, if needed. Garnish (optional) with a little swirl of sour cream (crème fraîche or plain greek yogurt), chopped chives or green onions and crisp bacon; adds a lovely touch. Soup may be served hot or cold; I like it hot. For a light lunch, serve with a slice of warm, buttered hearty bread. Or add a fresh salad or make a grilled cheese using fresh bread with some smoked gouda, cheddar or Gruyère cheese. Oh sorry, that’s what I would be making. 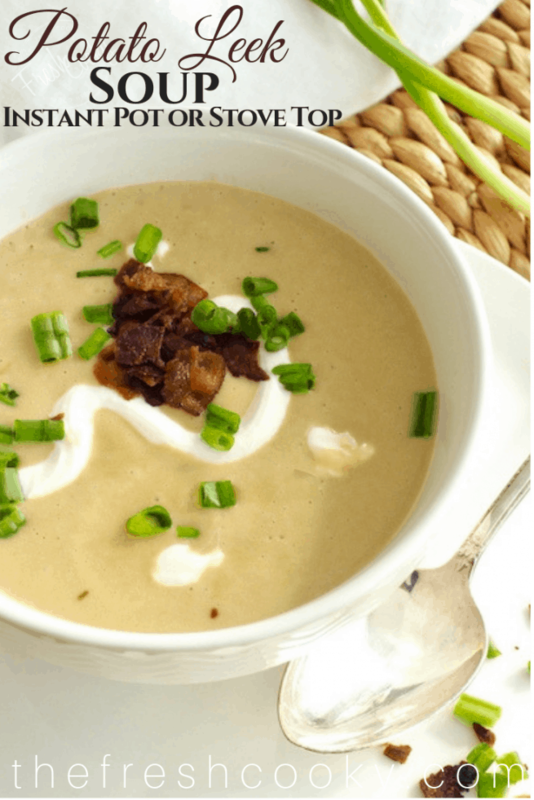 Sit back and relax, enjoy your silky, creamy, potato leek soup, you’ll thank me later! Try these other creamy, healthy soups.